Confession: I’ve been fascinated by ravens since I first heard Barry Lopez read his essay “The Raven” from his book Desert Notes. (This would have been around 1977. I was in high school.) In it, he catalogs the characteristics that distinguish crows from ravens. I started paying attention to large black birds after that. Ravens first made their way into my artwork over 20 years ago when I was a graduate student in painting. Much of the imagery from those days incorporated my summer experiences on the trail crew. Ravens flew over while we hiked, casting shadows on the ground in front of us. Now I live in a place where ravens are resident, and hear them flying and crarking over the house when I drink my morning tea. Bernd Heinrich studies ravens in Maine and Vermont. 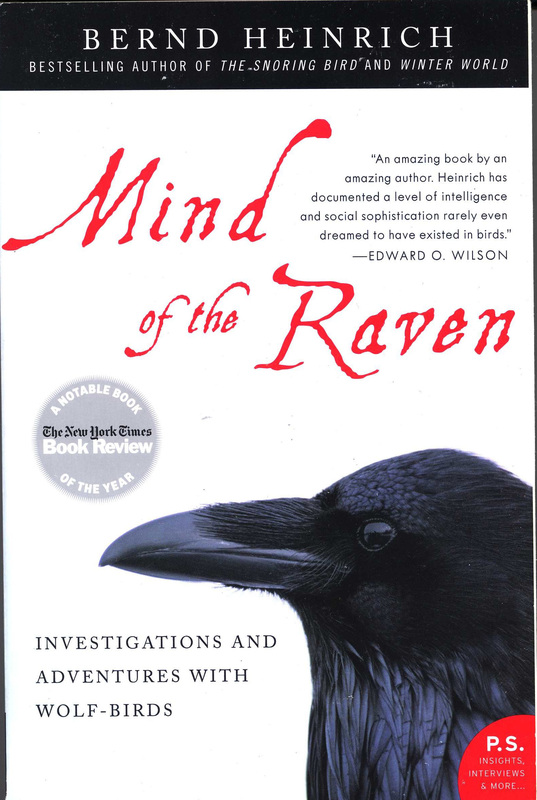 The Mind of the Raven is a sort of follow-up to his book Ravens in Winter. This recent book is more personal, telling stories of his adventures raising ravens from chicks caught in the wild as well as interacting with adult ravens. As a behavioral ecologist, he has many questions about raven intelligence, communication, problem-solving, etc. Ravens are smart and social, and have been observed hunting in association with wolves and humans. They are adaptable. They all speak more or less the same language, with different dialects around the world. Heinrich makes a case for ravens being among the most intelligent birds on the planet. The writing is clear and engaging, sliding smoothly along a spectrum of explaining scientific concepts to straight-ahead storytelling. The author’s humor and curiosity come through in each chapter. The book is illustrated with his black and white photographs and drawings. Once in awhile you come across a book that is throroughly enjoyable, educational, and unforgettable. The one raven fact that stays with me is that they are neophobes as opposed to neophiles (neo = new, phobe = fear, phile = love). When presented with a fresh carcass, ravens show up but do not immediately drop down to feed. They perch nearby watching while other birds and mammals begin to feed. Ravens need other animals to open the carcass since they lack claws and fangs. It may take them a day or two to decide that it’s safe to come down. Heinrich presented his captive ravens with many new objects in their aviary, and they were always cautious. Once they had experience with a new thing, or observed another raven interacting with it, they remembered and no longer feared that thing. I make an emotional leap here. I know myself for a neophobe also. The fact that ravens survive beautifully by not grabbing every bright shiny object that comes along is a vindication of a cautious nature. Or a nature that is satisfied with the way that things are (mostly). That doesn’t mean that there is no place for curiosity or playfulness. Ravens will investigate when they are confident of their ability to back off if the unexpected happens. They are magnificent flyers and will wing circles around eagles and hawks. They are willing to let jays and magpies take the first bites of potentially bad food and join later when they see it’s safe. Being a human neophobe in a neophile world is not such a bad thing. Some of us will always hang back and wonder if the latest new toy is worth all the hype, if it makes the world a better place, if eating that new food is a good idea. Let the lemmings rush over the cliff…ravens will be waiting to clean up the mess. The Mind of the Raven turned me inward to look at my own mind and nature. It also turns me outward, to keep observing these birds–so emblematic of the Pacific Northwest–to pay closer attention to their antics, to listen to their voices, to respect their ability to survive in town and in the wilderness. I will never look a raven in the eye, because they would never allow it. But I will greet them and admire them from my earthbound state. Nice review! Rich has read this book and it is now buried somewhere in my reading pile. We had a winter or two where a couple ravens were regular customers to our compost pile. Rich started buying chunks of fat at the grocery store and leaving them as offerings on the compost pile. One of the ravens was fairly bold, and the other was what we called the “Scardy-raven”. It would come in very hesitantly. “It’s a trap!” he seemed to say. We loved watching them. Lisa, how cool that you got to watch ravens close up! I hope you get to read the book soon–it’s worth it. From one neophobe to another: great review and interesting. I did not know that ravens kind of hung back like that. I agree they are an excellent teacher about not grabbing every new thing.